Stony Brook Women’s Soccer dominated the Wagner Seahawks offensively and defensively on Sunday, Sept. 9, leading to a 4-0 victory in front of a home crowd for the first time this season. 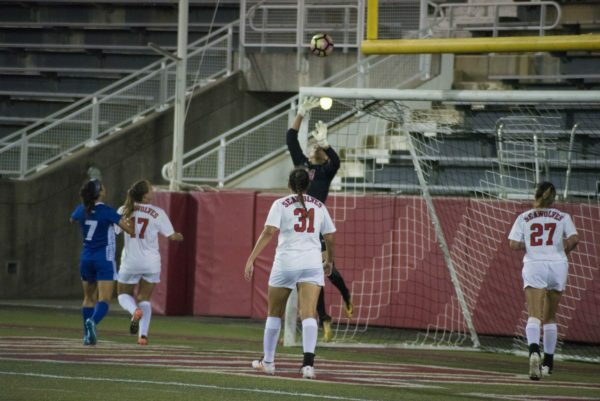 Stony Brook successfully enacted an aggressive attack strategy throughout the game, recording nine shots on goal and six corner kicks in the first half. The Seawolves broke the scoreless tie in the 22nd minute after sophomore forward Fanny Gotesson found an open sophomore midfielder Chelsie DePonte. DePonte split the Wagner defense and connected with a shot from the top of the box to the back of the net, giving the Seawolves a 1-0 lead. The Seawolves also displayed an impressive defensive prowess, preventing the Seahawks from recording a shot in the first half. Wagner finally broke its shotless streak in the 55th minute off sophomore forward Mya Donnelly’s scoring attempt, but sophomore goalkeeper Sofia Manner made a diving save to retain the Seawolves’ lead. Stony Brook forced an own goal in response to the Wagner shot attempt to extend its lead to 2-0. The Seawolves continued their offensive onslaught when freshman forward Tatum Kauka faked out the Seahawks’ defense with a spin move and blasted a shot to the back of the net in the 70th minute. The score was Kauka’s first collegiate goal and put the Seawolves up 3-0. Junior defender Skyler Mackey put Wagner away for good in the 82nd minute, converting a corner kick from senior forward Julie Johnstonbaugh into the goal, giving Stony Brook the 4-0 victory. The Seawolves’ originally scheduled home opener against the NJIT Highlanders on Thursday, Sept. 6 was cancelled due to inclement weather. While some teams would have used the extra two days to rest, Faherty called for an impromptu 60-minute scrimmage on Friday to rouse the struggling Seawolves as they looked forward to Wagner. The extra practice paid off. Stony Brook completed Sunday’s game with 23 shots and held Wagner to four, one week after the Seawolves were held to four against St. John’s. Stony Brook will head back on the road next week, taking on the Iona Gaels and Hofstra Pride in two intrastate contests. Stony Brook will head to New Rochelle, New York to take on Iona in the first of the two-game road trip on Wednesday, Sept. 12 at 3 p.m.